The International Three Meter is a class boat registered with the U.S. Sailing Association. 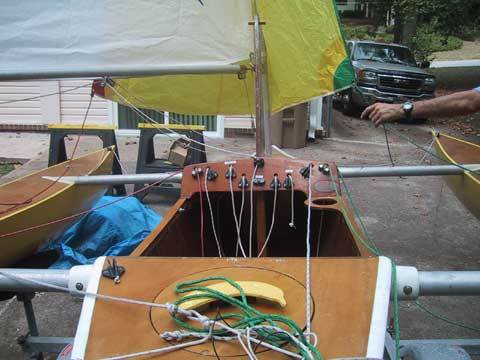 The first boat was designed by John Marples to be the smallest trimaran he could design that would carry one person. However as the class is now registered it is not specified to be a trimaran. It could for example be a catamaran, although I know of only one catamaran, the rest being tri's. There are 15 or 20 three meters in the Seattle area, about five in Portland, a few in eastern Washington and several in other parts of the world. 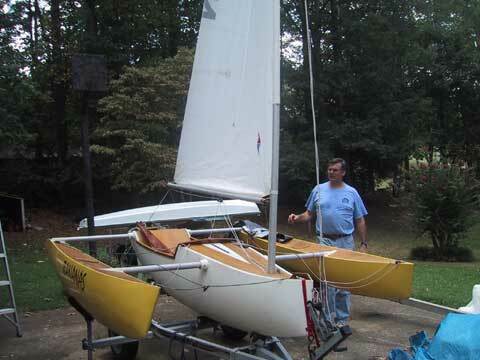 The boats are all home built, mostly from plans although many builders have made their own modifications. The class is a "design class" which means there are weight, size and material limits but no hull shape is specified. There is a standard specified sail. 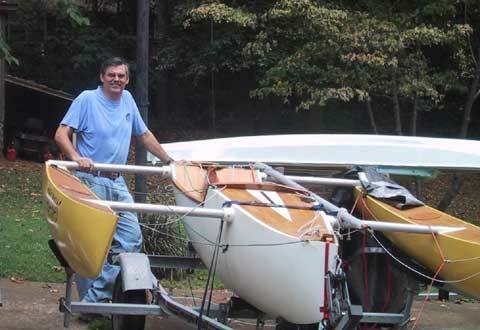 The parameters for the boat are the hulls can be no longer than 10 feet and total beam can be no more than 8 feet. No exotic materials, e.g. Kevlar, carbon fiber. The total weight of the boat plus the helmsman must be at least 380 pounds. Having a minimum weight insures that the lightest person does not have any weight advantage. Most of the boats are made out of wood although some hulls have been and are being built out of fiberglass. It takes about 200 hours to build one of these boats. Cost for materials including buying sails from a sail maker is around $1200. 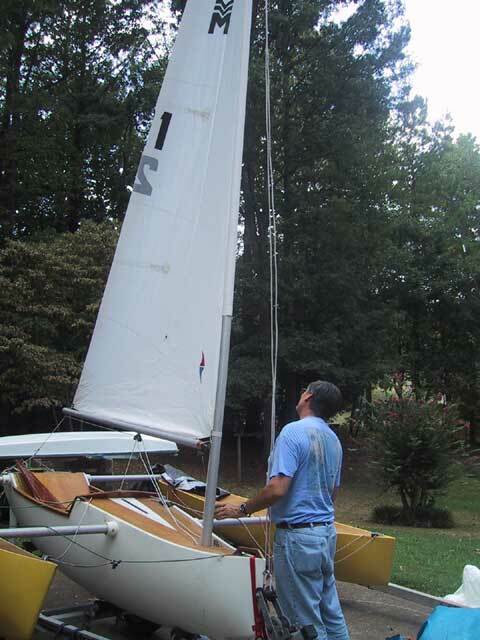 This includes wood, glue, fiberglass, paint, spar material and fittings, as well as sails. The boats themselves weigh 160 to 200 pounds. She is fiberglass over ply..